A stunning 1ct I-SI2 colour and clarity diamond solitaire, set on an 18ct yellow and white gold ring. Handcrafted by leading diamond cutter Leo Schachter, the Leo Diamond is cut to reflect light like no other diamond. With its unique facet design, it is the first diamond to be independently measured for its fire and brilliance. 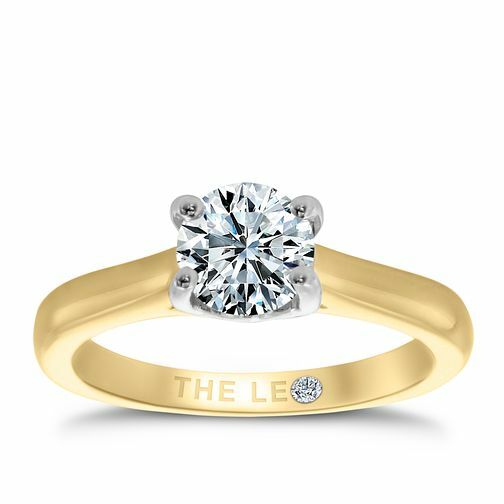 Leo Diamond 18ct yellow & white gold 1ct I-SI2 ring is rated 5.0 out of 5 by 1. Rated 5 out of 5 by Anonymous from Absolutely Stunning I was lucky enough to get bought this ring for our 25th wedding anniversary and it is absolutely gorgeous. The diamond sparkles from every angle and is the perfect size for my finger. I looked at lots of rings but this one was my favourite as the setting/mount is lovely and the diamond just had so much more sparkle than others I looked at. My ring size wasn't available but Ernest Jones allowed me to choose from several of this ring in a bigger size to find my perfect diamond and then they had a new band made for it - I actually got a slightly better clarity and colour diamond than specified on here so was even happier!! A year on and it still amazes me how much it sparkles. One very happy (and lucky) lady! !